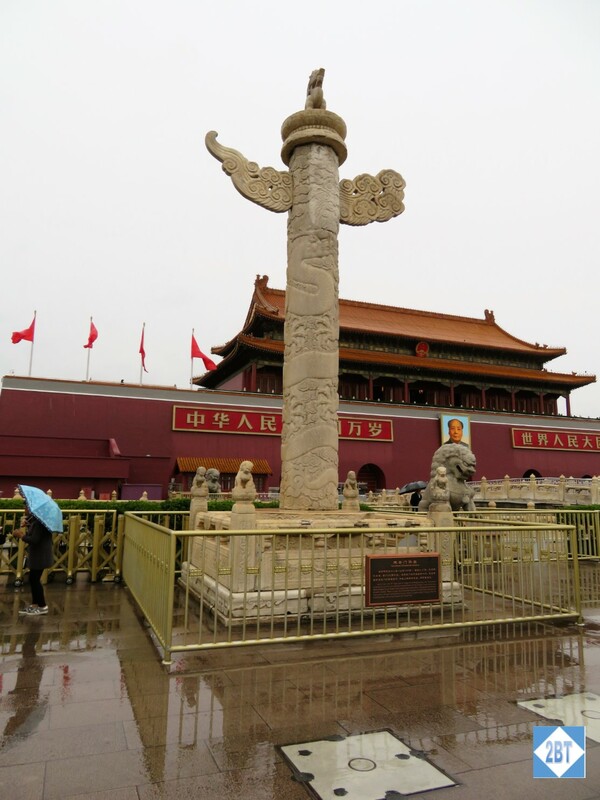 We approached the Forbidden City from Tiananmen Square via a tunnel that crosses under the busy street running between the two sites. After seeing the way people drive in busy sections of China, I was very glad we didn’t have to dodge any cars! 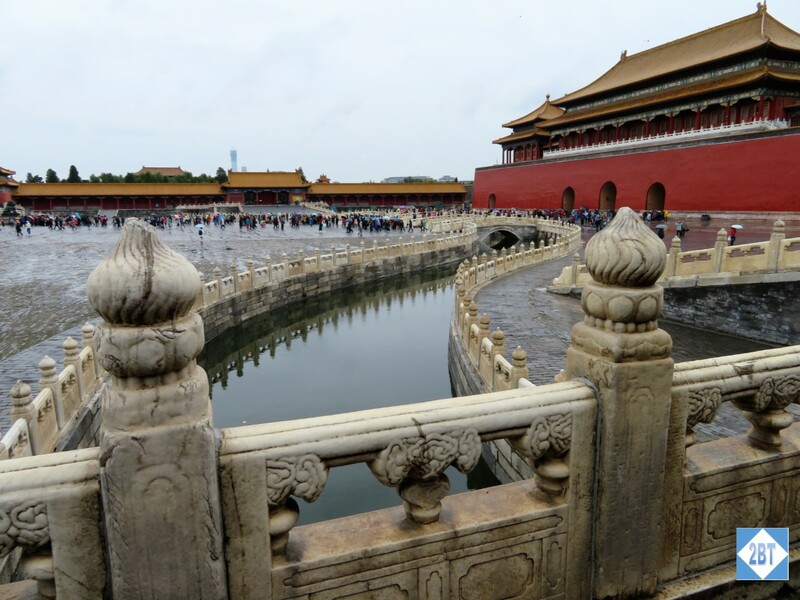 The palace is the former seat of the throne of Imperial China which began with the Ming Dynasty in 1420 and lasted through the end of the Qing (“ching”) Dynasty in 1912 – nearly 500 years. 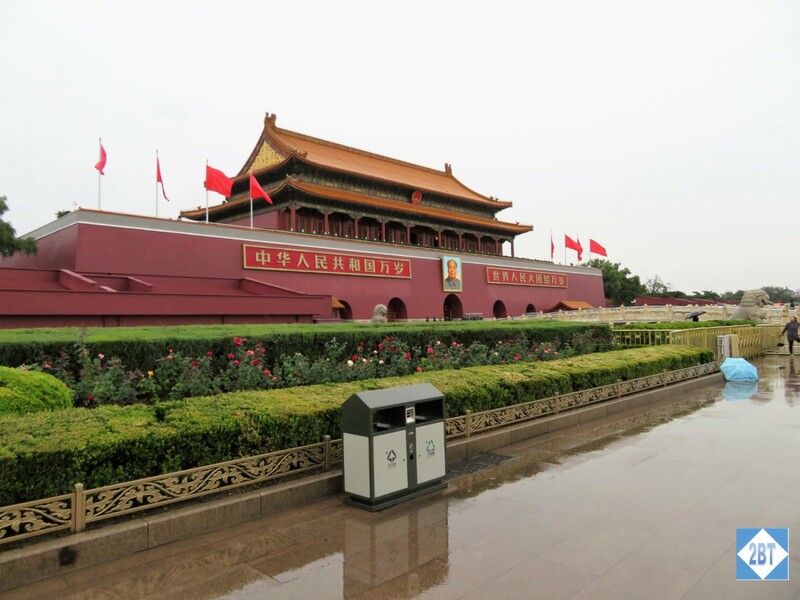 It was both the home of the emperor and his household and the ceremonial and political center of the Chinese government. 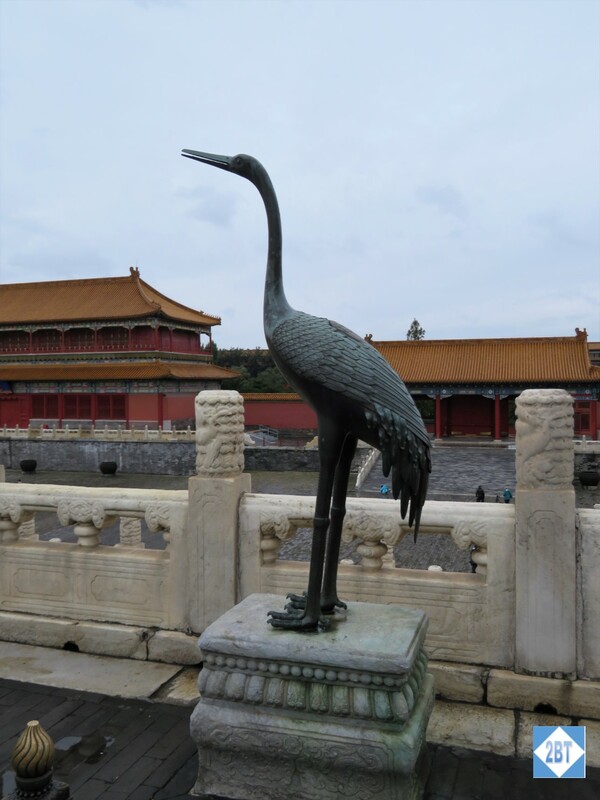 If you’ve seen the movie The Last Emperor starring John Lone, it was the first feature film ever authorized by the PRC to be filmed inside the Forbidden City. 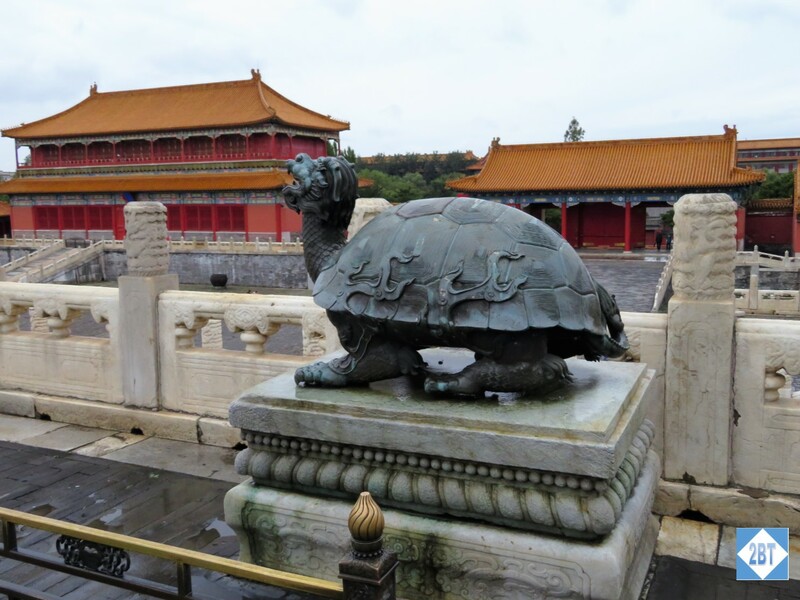 The name “Forbidden City” is a translation of its Chinese name that literally means “Purple Forbidden City”. The purple would refer to the North Star which in Chinese astrology refers to the heavenly abode of the Celestial Emperor and thus the emperor’s residence is its counterpart here on earth. It is a massive complex of over 980 buildings covering over 180 acres. 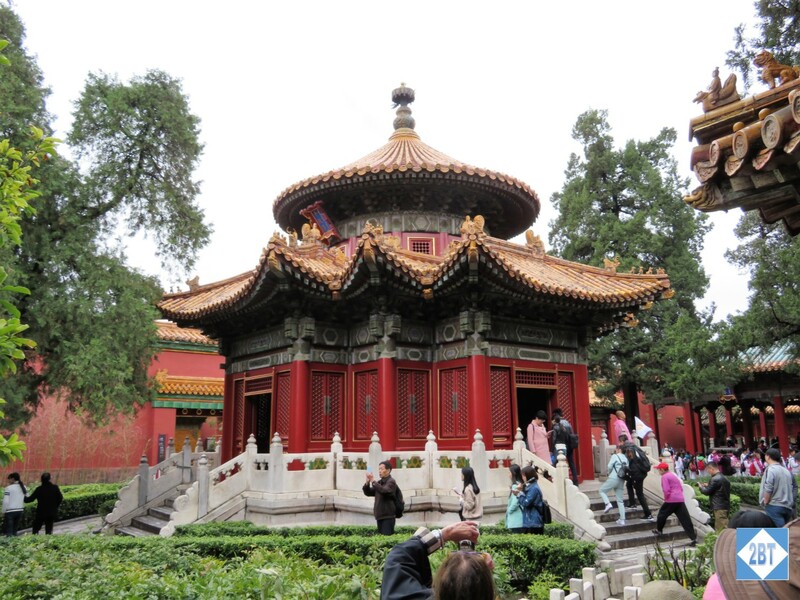 It is a UNESCO World Heritage Site as the largest collection of preserved ancient wooden structures in the world. Though the design of the walls and the buildings were different, the general flow of the buildings reminded me a bit of the Topkapi Palace complex in Istanbul: Entering via a gate into a courtyard, then through another gate into a courtyard and so on until finally reaching the family quarters at the far end. I guess it’s not surprising as Topkapi was built a few decades after this palace so it’s very possible this was a tried-and-true style of the times. 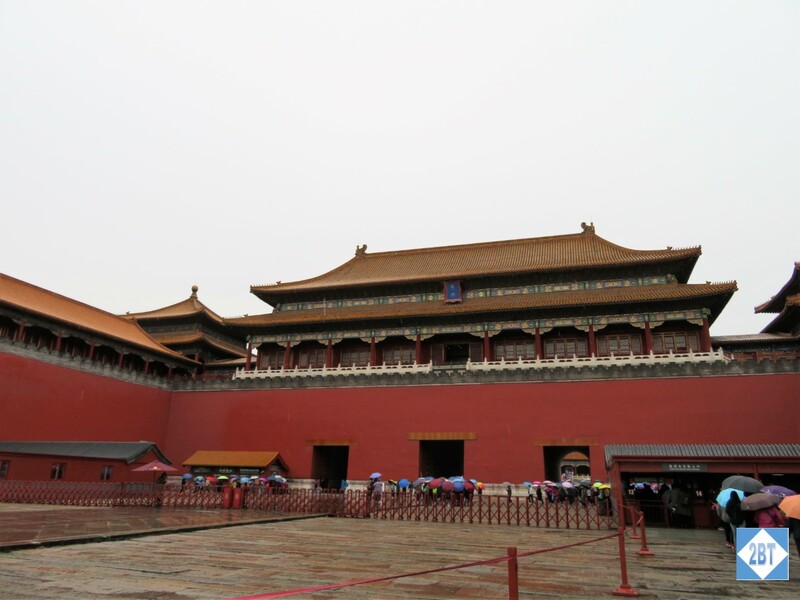 This is the Hall of Supreme Harmony is the largest surviving wood structure in China. 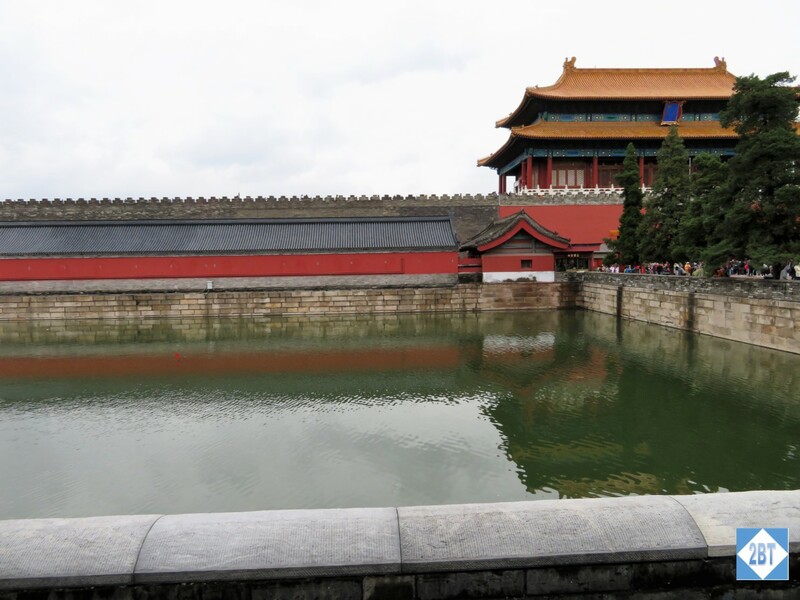 It was here that the Emperor held court though in its later years as court was held more often, a less grand location was used instead. 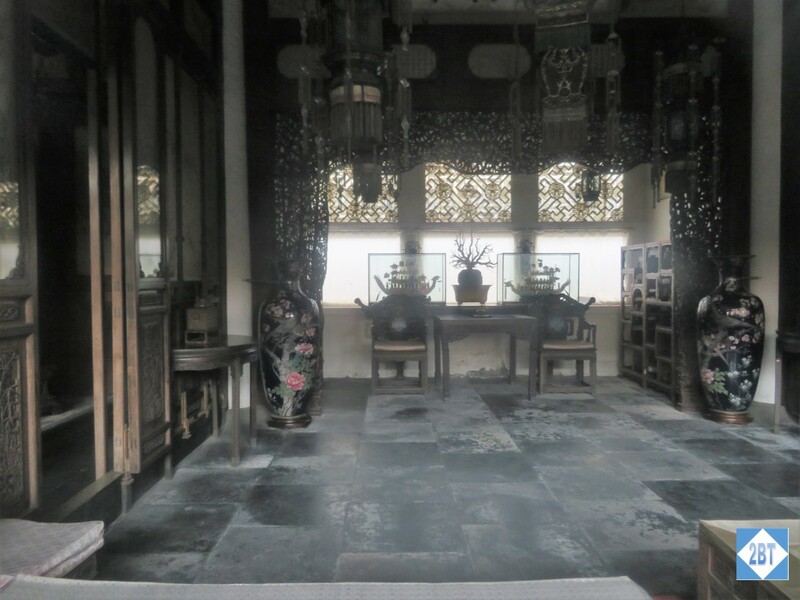 By then this hall was used mostly for ceremonies including coronations and imperial weddings. 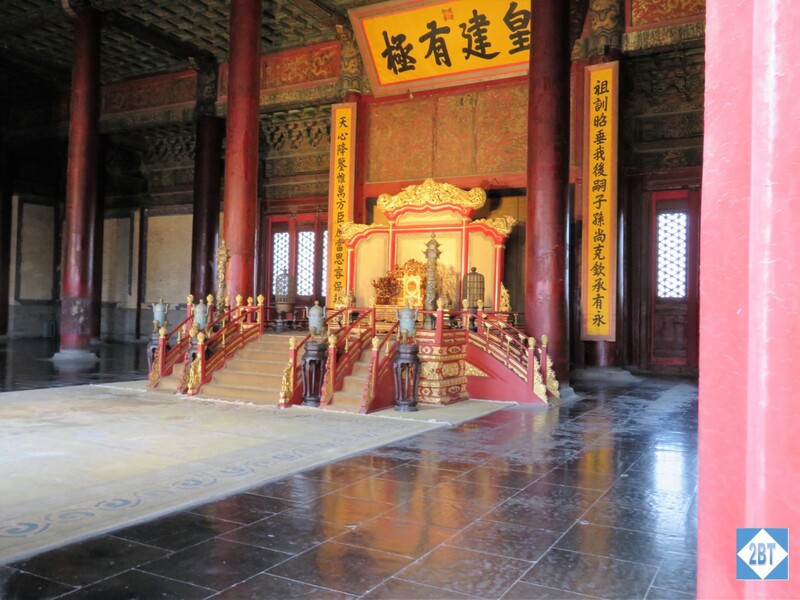 This is throne in the Hall of Preserving Harmony, which was used for rehearsing ceremonies and was where imperial examinations, to see who was qualified to become members of the bureaucracy, were held. Maybe for keeping water hot? I have no idea what this is for! 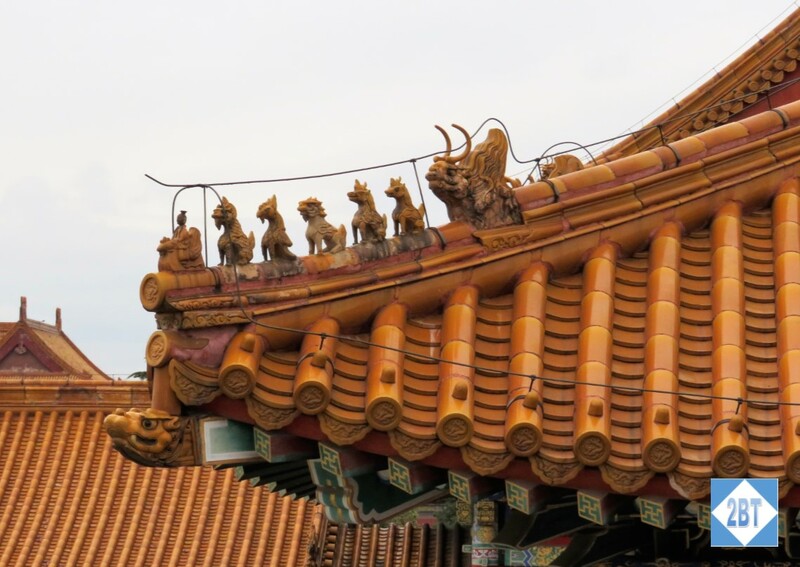 The corners of most of the roofs have a line of statuettes featuring a man riding a phoenix followed by an imperial dragon. 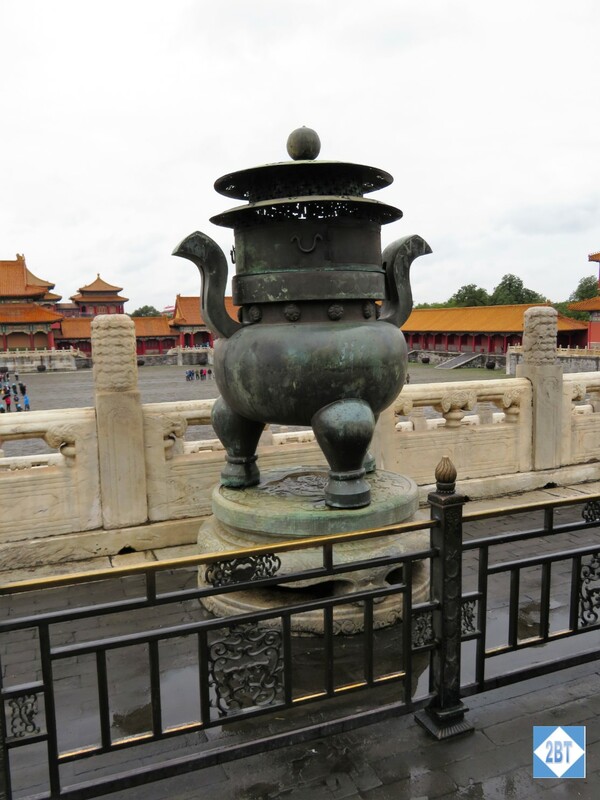 The number of statuettes indicates how important the building is. 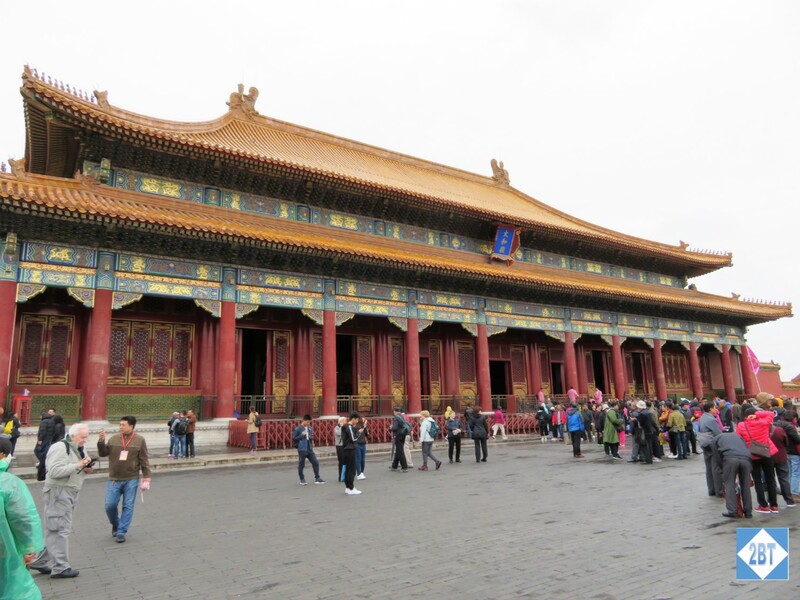 The Hall of Supreme Harmony had 10, the only building permitted to have so many during imperial times. 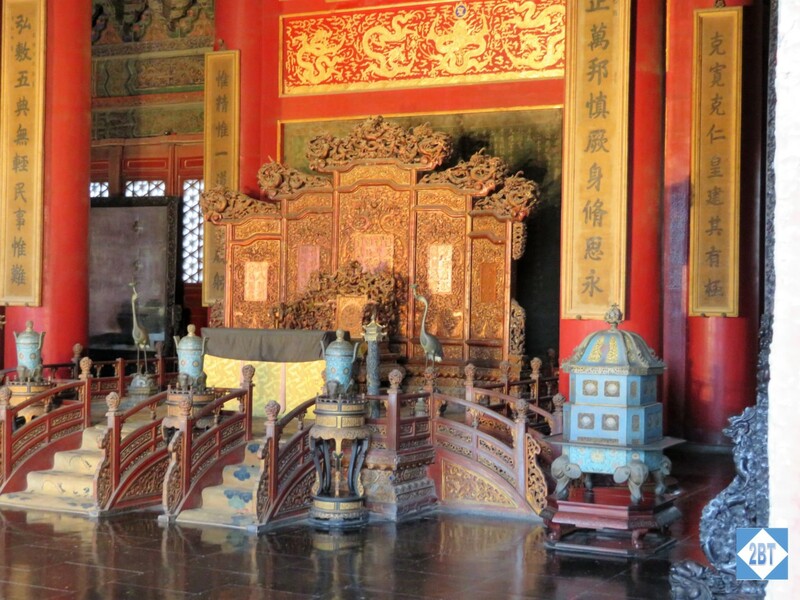 This is the throne in the Palace of Heavenly Purity, which was initially the residence of the Emperor but during the Qing dynasty became the Emperor’s audience hall. 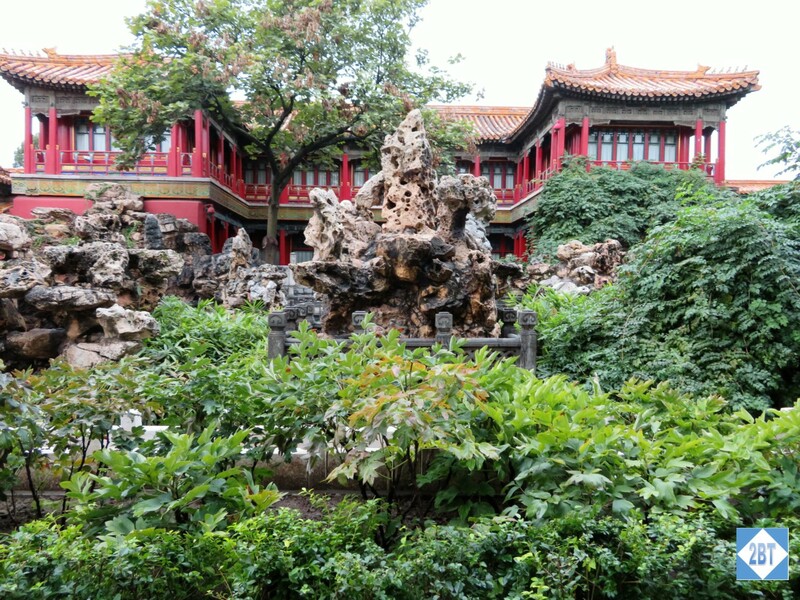 Toward the back of the complex was the residence of the Empress. 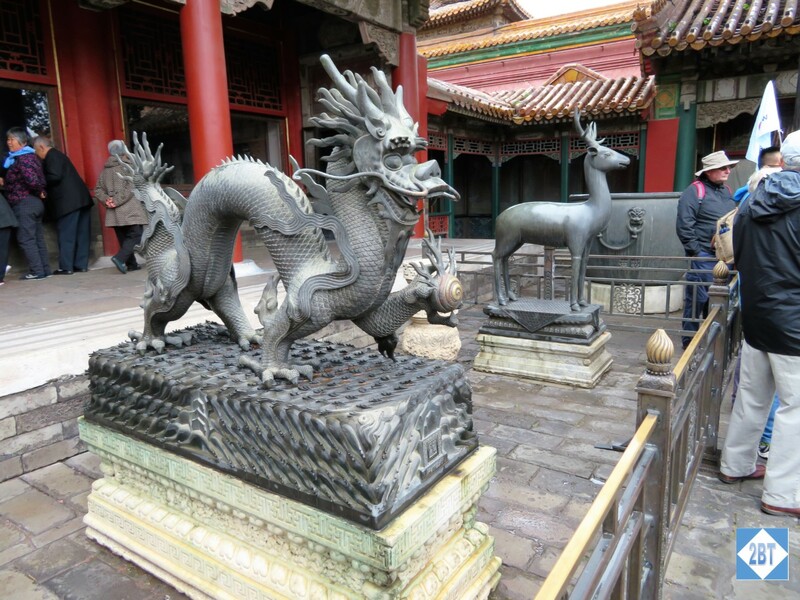 The Dragon (Emperor) and the Deer (Empress) outside the residence of the Empress. 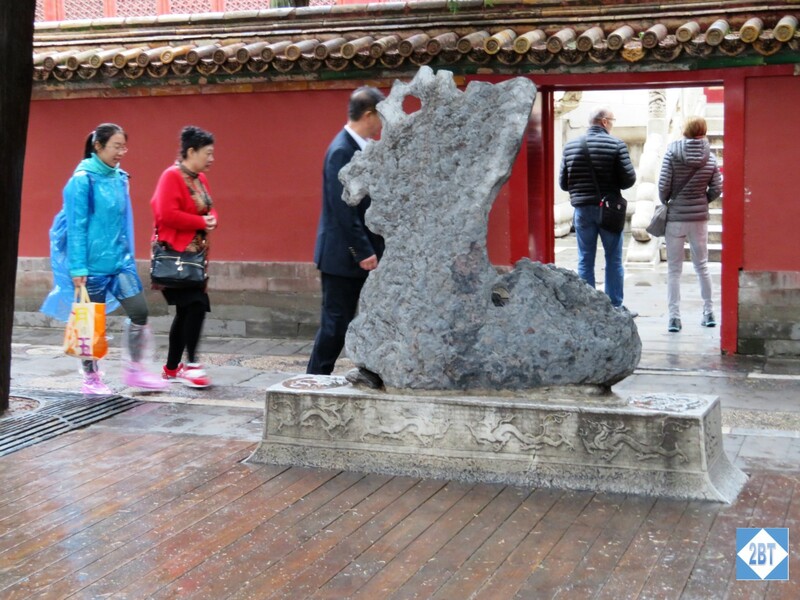 In the Imperial Garden were a number of rocks worn by water over time, making for some interesting art pieces. 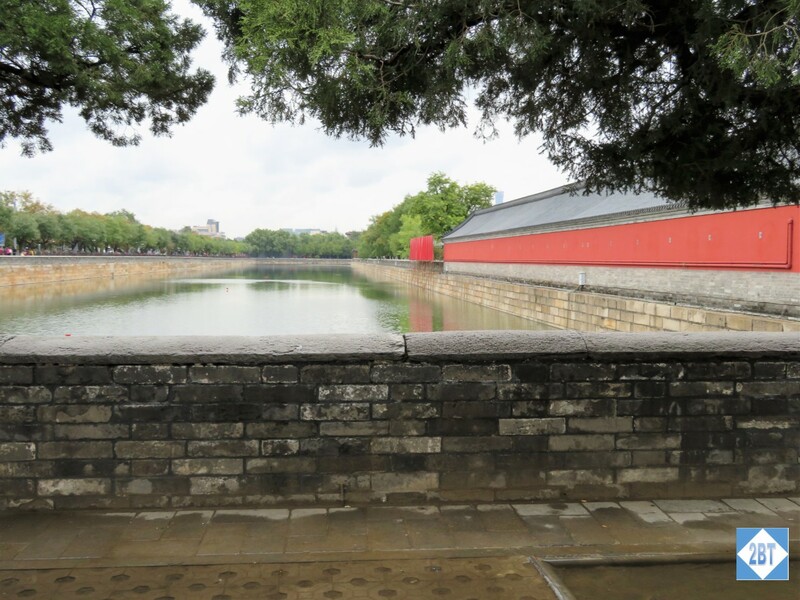 The moat is 171 feet wide and 20 feet deep. The walls are 26 feet high and over 28 feet wide at the base though they taper to just under 22 feet at the top. Their core is rammed earth with layers of baked bricks on both sides. We were thrilled that the rain finally let up when we were about halfway through the tour. 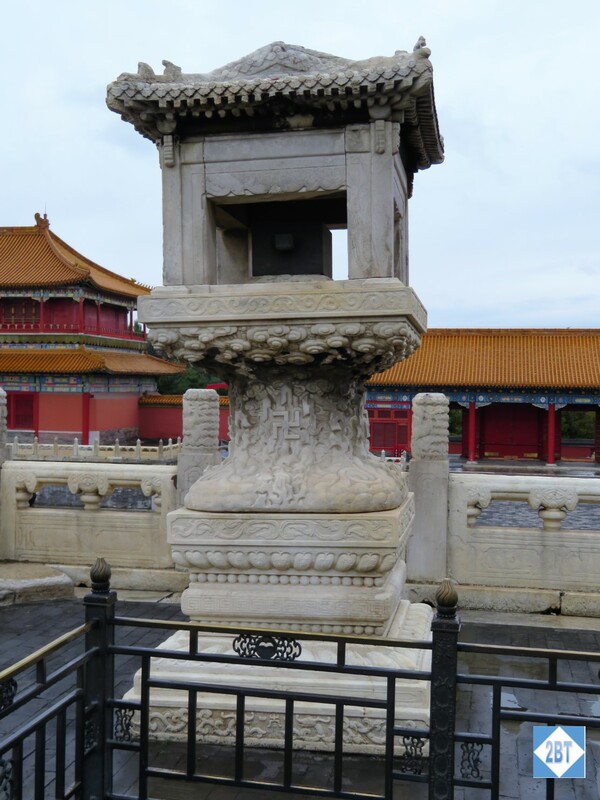 We didn’t get to visit any of the internal exhibits of jade, porcelain or artwork but it was enough to soak in all the parts we did see. My pictures don’t come close to doing it justice – it’s just a vast, amazing place.